Lars Lysdahl and Kjetil Solbrække. «Where else would they invest», Rystad Energy advisers ask during April Info Session. 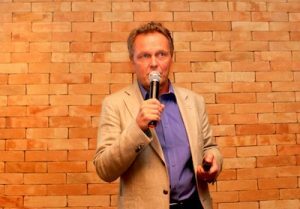 Lars Lysdahl is the Principal & Head of Consulting in the New York office of Rystad Energy, and he was positive on behalf of Brazil in his presentation to the Rystad Information Session in Rio de Janeiro on April 5, 2018. According to Mr. Lysdahl, Brazilian authorities have taken several important actions lately, like easing and waivers on local content requirements, sale of Petrobras assets to reduce debt and frequent licensing rounds. Future is also looking brighter for Petrobras, as the cash-flow outlook is strong. «The last 5 year Investment Plan is now in line with our forecast. It is not too aggressive», Mr. Lysdahl says. The main improvement in the Brazilian market is the opening of pre-salt allowing foreign oil majors to be operators. Despite the downturn, pre-salt is growing. «The majors are ready, with big pockets. Where else can they invest? Brazil has big volumes and a healthy looking development portfolio with several operators. 2018 will likely be the year that the market hits the bottom, after a five year downturn, and from 2019 we expect a slow, steady upturn», Mr. Lysdahl (in the photo to the left) says. Lars Lysdahl also shared the Rystad estimates for the oil price. The range of potential outcomes is however wide. «Oil demand keeps surprising on the positive side, and current upstream activities are insufficient to sustain the demand on a longer term. This will hit the market at some point.» Rystad Energy expects 1 percent annual growth resulting in a demand projection of 105 billion barrels per day (boepds) in 2025. Current demand is 97 billion boepds. 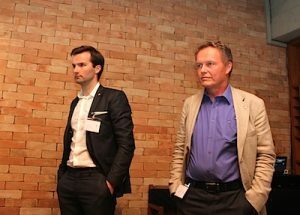 A second presentation was made by Kjetil Solbrække, Senior Vice President South America (in the photo to the left). He focused on the increased diversity in the Brazilian offshore market. «Brazil is becoming a consolidated oil and gas nation with an enormous growth potential. A lot of new players are coming, and all the majors are present.They bring expertise, increase competition and boost local industry. The majors are not only after the pre-salt developments. New and smaller players also see opportunities and will bring additional capital to prolong the lifetime of mature fields», he said. 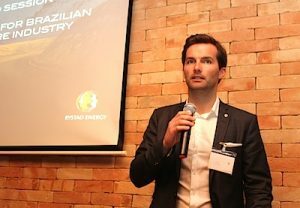 Mr. Solbrække also talked about the future gas developments in Brazil and the challenges that lacking infrastructure present. 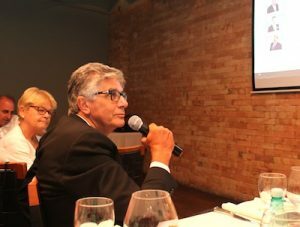 NBCC president Rachid Felix with Consul Sissel Hodne Steen (in the back) during Q&A session. The presentations were followed by a Q&A session and dinner. Rystad Energy is an advisory and consulting firm established in 2004, with 13 offices around the world.